This is not an exhaustive list - it details the drive systems you are most likely to encounter in woodworking. At the end of the section is a table of driver sizes to use with various screw sizes. The two critical measurements for the driver are it's width, which ideally is the same as the length of the slot, and its thickness. Due to wear, repeated grinding and a lack of manufacturing standards the tip rarely is the correct thickness. Because the screwdriver tip is usually thinner than the slot it contacts the screw only at the edges of the driver, rather than across it's whole width. The screwdriver blades are tapered. They are thin at the tip and widen as they get further from the tip. An angled diver surface is forced against a straight screw surface. This means only part of the twisting force on the driver is applied to the screw - the other part is trying to lift the driver out of the slot. Of course, when the driver lifts, it damages the screw. This is now one of the more common drives. Like the slotted drive, the tries to lift out of the screw when forced. In fact it was specifically designed to force the driver to "cam out" of the screw before enough force was applied to strip the threads. This is the next generator up from Phillips. It is designed to put more bearing surfaces in contact with the driver. If you happen to pick some up, you can drive them with a Pozidriv - PZ - driver. The driver sides are straight (or nearly so). Since there is no taper trying to lift the driver out of the screw you don't have "cam-out" problems. Straight sides also mean that you can put a screw on the driver and it will stay there in almost any position except vertical. You don't need one hand on the screw and one on the driver. The sides are a close fit with the screw head - no stripped heads. There are only four sizes of drivers. In the typical wood shop 99% of the work will only use two of them. This is a relative new-comer. You don't see much of it in wood screws. It offers some of the same advantages of the square drive, in that it the drivers have straight rather than tapered sides. You will see it mostly on hardware. You're familiar with this one if you've ever had to adjust any of your power tools. It's the familiar hex-head bolt design, but with the hexagon shape recessed into the head. Like the Torx, in wood working you'll encounter it on hardware. These are systems that let you use more than one kind of driver for the same screw. 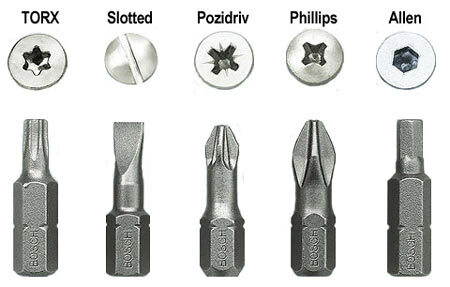 This combination lets you use either a Phillips or a regular slotted driver. This system uses a Phillips driver, but has a square recess in the center to take a Robertson or square driver. There are many other combinations. A close look at the screw head will show you which drivers you can use.